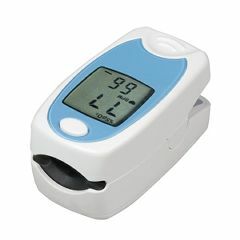 The HealthSmart Standard Finger Pulse Oximeter is small and lightweight pulse ox with a large LED display. The HealthSmart Oximeter is an easy and accurate way to monitor blood oxygen saturation levels and heart pulse rate. It is ideal for any situation where a fast measurement of vital signs is needed. The finger pulse oximeters standard size accommodates finger sizes from pediatric to adult. Get long battery life with the low power consumption and auto power off. Convenient one button operation. 2 AAA batteries are included. I USE THIS PRODUCT EACH MORNING TO MEASURE MY O2 SATURATION LEVEL AFTER MY NIGHT'S SLEEP. MY SATS ARE USUALLY LOWER IN THE A.M. I ALSO AM A CANDIDATE FOR USING A SLEEP MACHINE DUE TO SEVERE SLEEP APMEA. I've definitely gotten my money's worth. Portable to use anywhere. Quickly reads stats. Works for children. I have no cons to add. I use it for my grandson. My grandson has poor circulation making it difficult for the finger tip meters to read his oxygen level. This meter is able to read his oxygen and heart rate. It takes a little longer to read his but still quicker than my previous pulse oximeter. I found a real bargain when I caught this product on sale. I'm very happy with it. Perfect tool for our work. Nothing to say, great too. by Capt. Bob from West Wareham, Ma. Good product, accurate pulse rate. Good for a quick check of pulse rate during exercising. This is a great product and helpful. This is a great product to have is you have any respiratory health problems. I think it works great. Havent had any problems.